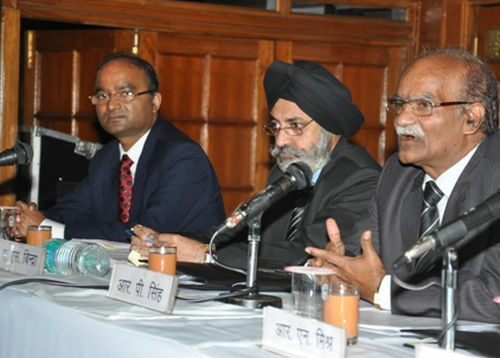 In the Annual General Meeting of SJVN held on 12th Sept. 2013, the Shareholders have approved a dividend of Rs.0.96 per share (Rs.397.12 crore) as against the dividend of Rs.0.94 per share (Rs.388.84 crore) for the previous year. This is the highest ever dividend paid by SJVN since commissioning of its flagship 1500 MW Nathpa Jhakri Hydro Power Station in 2003-04. Equity holders Govt. of India will get a dividend of Rs.256.02 crore (64.47%), Govt. of Himachal Pradesh Rs. 101.27 crore (25.50%) and the public shareholders will get Rs. 39.83 crore (10.3%). The dividend yield on the Company’s shares is also one of the best amongst the Power Sector PSUs. SJVN’s shares were listed on the stock exchanges on 20th May, 2010. SJVN earned total revenue of Rs. 1916.62 crore Profit Before Tax of Rs. 1184.58 crore and a net profit of Rs. 1052.34 crore during the year 2012-13. During the year 2012-13, SJVN’s 1500MW Nathpa Jhakri Power Station (NJHPS) continued to achieve new milestones of generation. The plant generated 6777.77 MUs of energy and exceeded design energy of 6612 MUs at a record Normative Plant Availability Factor of 105.15% The PLF of 2011-12 was 104.26%. The power station also established a record by generating 1186 million units of electricity in a single month during July, 2012, as well as the highest single day generation of 39.015 MUs on 27th July 2012. 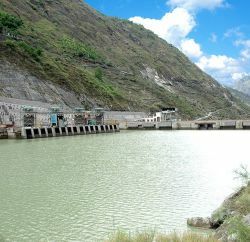 12% of the power generated at this power station is supplied free of cost to Himachal Pradesh while 25% of the remaining generation is supplied at generation cost. The remaining power is supplied to nine (9) states of the northern grid namely Haryana, J&K, Punjab, Rajasthan, UP, Uttrakhand, Delhi and Chandigarh. During the quarter April to June 2013 SJVN’s 1500 MW Nathpa Jhakri Hydro Power Station generated 2329.76 million units of electricity which was 11.4 % more than the 2091.52 MU achieved during the corresponding quarter of last year. The country’s largest hydro power station also established a new milestone by achieving the highest daily generation of 39.147 million units on 29th May, 2013 against the schedule generation of 36 million units. During the quarter, the power station also surpassed a cumulative generation of 60,000 million units since its commissioning in Oct., 2003. The Plant Availability Factor achieved during the quarter was 108.218%. As a result of the 11% increase in electricity generation, SJVN Ltd. recorded a 8.87% increase in the PAT (Profit After Tax) during the first quarter of FY 2013-14. The net profit of the company increased to Rs. 343.24 crore from Rs. 315.27 crore earned during the corresponding quarter of last financial year. During the financial year 2013-14. SJVN targets to generate 6930 million units of power (under Excellent parameters) with an expected revenue realization of Rs.1783 crore from hydro as well as its upcoming 47.6 MW Khirvire Wind Power Project (55 MU), in Maharashtra. The Gross Energy Generation till 12th September 2013 was 5066 MUs as against 4765 MUs for the corresponding period of previous year and 403 MU more than the MoU targets. The Plant Availability Factor for the period is 107.84%. Wind Power: During the year SJVN is scheduled to commission the Khirvire Wind Power Project of 47.6MW capacity in Maharashtra. This happens to be our first foray into tapping non-conventional energy sources. Thermal Power: SJVN has made a debut into the Thermal Sector by securing 1320MW Buxar Thermal Power Project in Bihar. SJVN has taken over Buxar Bijlee Company as its 100% subsidiary. The Company has also been allotted Coal block in the 2102 Million Tonne Deocha-Pachami Coal Block located in West Bengal for the Project. To undertake implementation of this project, SJVN has also established a fully owned subsidiary which will be known as “SJVN Thermal Pvt. Limited”. This (2 x 660 MW)1320 MW Thermal Power Project will be located at Chausa in Bihar and will generate 9828 Million Units of electricity at 85% Plant Load Factor. The power station will be established at a cost of Rs. 6791.36 crore at May 2008 price level and will generate electricity at a levelised tariff of Rs. 2.59 kwh. The plant will be constructed by using super critical technology. Solar Power: SJVN has already initiated the process for setting up its first Solar Project in Gujarat. The Company will continue to invest its men and resources to explore and expand into the domain of non-conventional energy. In addition, Pre-feasibility reports of 60MW Ranganadi Stage II Project, 378 MW Kameng-1 Project and 80 MW Doimukh projects in Arunachal Pradesh have been prepared by SJVN and in all probability, the Company would be executing these projects in the coming years. b) Development of high strength concrete with reference to SJVN’s projects. c) Performance of different types of rock bolts in different kinds of rock strata for standardization. f) Study to improve quality of survey & investigation for DPR preparation. All the projects have been completed and total expenditure on R&D projects completed during the FY 2012-13 was Rs. 5. 94 Crore. SJVN developed its Sustainable Development (SD) Policy in line with Department of Public Enterprises (DPE) guidelines with a purpose to ensure that the three pillars of Sustainable Development, viz, Social, Economic and Environment are adequately taken care of while developing a project. In the year 2012-13, SJVN earmarked Rs. 583.43 Lakhs for SD activities. 5. Energy Efficiency – installation of solar lights in SJVN’s guest houses. 6. Drinking water supply schemes / restoration of dried-up water sources. 7. Afforestation / Plantation / Horticulture / Agriculture Development etc. SJVN has implemented R&R Plans in NJHPS and RHEP incurring cumulative expenditure of Rs. 13.60 Crore and Rs. 26.80 Crore respectively. SJVN has adequately compensated all the 2596 land owners in NJHPS and 202 land owners in RHEP under the provisions of Land Acquisition Act whose land was acquired for execution of the projects. In NJHPS, 109 landless PAFs have been provided alternative agricultural land, 61 families have been provided regular employment, 55 landless families alternative package of Rs. 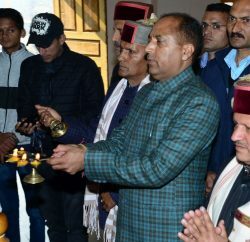 2 – 3 lac in lieu of employment, 25 houseless families have been provided constructed houses and 44 houseless families have been provided cash assistance of Rs. 45,000 each in lieu of constructed houses. In RHEP 57 landless families have been provided rehabilitation package ranging from Rs.45,000/- to Rs. 65,000/- depending upon the quantum of land acquired. 15 houseless families have been provided house plots of 280 sq. m. each plus house construction grant or Rs. 1.8 lac each. 3 other houseless families have been provided equivalent lump sum cash grant of Rs. 9.9 lac each. The Corporate Social Responsibility Plan for the financial year 2012-13 was implemented with an outlay of Rs. 16.03 Cr. which is 1.5 percent of profit after tax (PAT) of the previous financial year 2011-12. The annual CSR programs were evolved on the basis of baseline survey conducted by an independent external agency, Agro Economic Research Centre, HP University (HP) and are governed through SJVN Foundation. During the current financial year, SJVN has launched its flagship CSR programme “SJVN Silver Jubilee Merit Scholarship Scheme” under which 147 meritorious students of 12th standard from Himachal Pradesh and Uttrakhand states were awarded Rs 2,000 pm each for pursuing higher studies. As a drive towards skill development of local youth, the Foundation sponsored 60 candidates from Project Affected Areas for various vocational courses in Govt. ITIs. Latest farming techniques to 550 farmers were imparted through various specialized agencies. Under the ITI Adoption Scheme of Govt. of India, the Foundation extended financial assistance of Rs. 1 Cr each to ITI Berthin and ITI Bangana in H.P. As a support to upgrade technical education in the State, the Foundation contributed Rs. 5 Cr. to ABV Govt. Engineering College, Pragatinagar whereby the total SJVN contribution became Rs. 11 Cr. In the field of health care, the Foundation catered to the prime requirement of people inflicted with muscular dystrophy by providing powered wheel chairs to 9 persons each. Free medical care to 11,500 local populations through mobile health vans (MHV) was extended. An innovative programme of “Silver Jubilee Women and Child Development Scheme” was launched under which financial assistance of Rs. 10,000/- each to 10 BPL women was provided for pre and post natal care. As a measure towards clean environment, garbage disposal containers were installed in 9 villages of NJHPS and RHEP. Giving thrust to participatory approach, Village Development Advisory Committees (VDACs) have been constituted and MOUs executed for construction of community assets in the local villages. 25 community assets like construction of school rooms, play grounds, fencing of play grounds, water fountain in Community Park, shopping complex near Panchayat Bhavan, steel benches at public places etc. have been created in the local area in collaboration with VDACs. The infrastructural works carried out through participatory approach have created employment of 21,500 man days for local people. 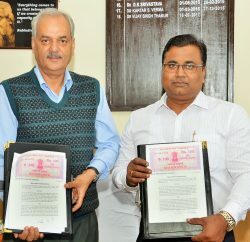 As a part of beautification of Shimla, SJVN has signed MOU with Municipal Corporation, Shimla for construction of 6 parks and street scaping of 2 sites at an estimated cost of Rs. 3.35 Cr. spread over three years. The CSR implementation of SJVN for the FY 2012-13 has been evaluated by “External Committee of Experts”. The committee’s report reveals that the CSR implementation is in conformity with the targets set under MOU 2012-13. The contribution of SJVN Foundation in CSR area has been adjudged outstanding by civic bodies and forums which are evident from the accolades conferred on SJVN like Achievement Award for Social Development and Impact – 2013 by Construction Industry Development Council (CIDC), Institute of Public Enterprises (IPE) Subir Raha CSR award 2012, Most Caring Companies Award by World CSR Congress, Greentech CSR Appreciation Certificate – 2012 and Africa CSR Award.